The rush of a cool autumn breeze, colorful leaves dancing across the grass and the warmth of another Woodland Sunset slipping away. A blend of Roses, Sunflowers, Solidago, Mums and Lotus Pods are arranged in a naturally weathered oak vase. 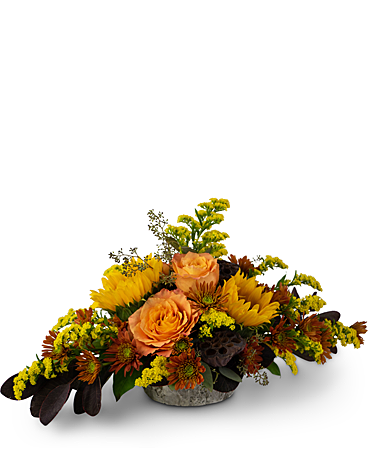 The Woodland Sunset arrangement is a great way to enjoy the fall season.